Yes, Virginia, we are smart in the coalfields. Excuse me for being a little defensive, but during a recent meeting with state officials I was asked if far Southwest Virginia “has the DNA to fill cyber security jobs.” Most subgroups of Americans who are consistently demeaned by bigots or the merely misinformed have an organization or two that take to the streets when overtly insulted. We Appalachians don’t have one, yet. Our schools consistently place in the top three brackets in forensics, robotics, and the arts in statewide competitions. But if facts matter, please read on: The majority of coalfield school districts roundly beat Albemarle County (74th out of 132 in the state), Charlottesville (85th), Richmond (116th), and Prince Edward County (131st). Our much-maligned region is home to eight school districts ranked in the top 25. In fact, three of the seven ”coalfield” counties, Wise (2nd), Russell (11th), and Scott (13th), are in the elite upper 10 percent, based on state test score rankings from Schooldigger.com. Many of our middle and elementary schools also score well above the state average. Another media alert, our schools consistently place in the top three brackets in forensics, robotics, and the arts in statewide competitions. Far Southwest Virginia has a well-maintained system of multi-lane roads, no traffic jams, and plenty of affordable housing and land. (Farms or forested hideaways for $1,000 an acre, anyone?) 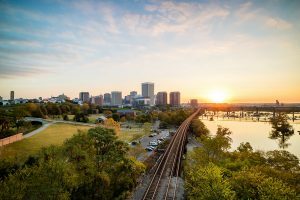 Skilled and semi-skilled labor, construction and earth-moving work also costs 25 to 50 percent less here than in Richmond and Northern Virginia. We live in the most biologically diverse native ecosystem in the Northern Hemisphere. That’s right, Virginia, the Clinch River Valley has that honor and just like our great public schools, this is some kind of big secret as well. But we have that covered too: The University of Virginia at Wise is poised to open an international ecology center to study, protect, and learn from this natural treasure — and the Clinch River State Park will open its blueway linear outdoor showcase soon. Downtown Richmond, Virginia skyline and the James River at twilight. We have hundreds of miles of maintained ATV, hiking, biking, and equestrian trails, class VI seasonal rafting and kayaking, secluded camping sites, more than 100,000 acres of public hunting and fishing lands, majestic elk, fancy hotels, breweries, farm-to-table foods, clean air, ample water, the largest variety of freshwater fish, and a welcoming culture. Our abundant open spaces and building sites are flood-proof (just build a few feet upslope), hurricane- and rising-sea-level-proof, and we enjoy four distinct temperate seasons per year with less heat and humidity in the summer than eastern Virginia and more rain year-round than the rest of the state. We invented Virginia green! And we are open for business. This article was originally posted on Richmond.com.